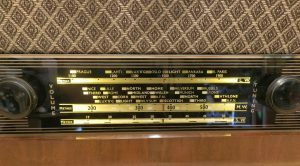 There is no need to destroy a vintage radio when fitting Bluetooth! My passion for repairing and restoring vintage valve radios spans over fifty years. In the old days, these radios weren’t classed as vintage. Parts were freely available and the radios were relatively straight forward to repair. However, things have changed. Sadly, with the passing of time, some radios are now beyond redemption. This is often down to rust and corrosion which is the result of the radio being stored in a damp environment, such as a garden shed. Some radios have suffered major component failures, such as transformers, which are no longer available. Some have missing parts which can’t be replaced. Whatever the reason, the future of a cherished radio can appear gloomy. A major problem these days is interference. In certain locations, reception on long and medium wave can be very poor due to interference or weak signals. Your radio might need an external aerial to improve reception but this doesn’t always help. Again, the future of your cherished radio can appear gloomy. One option is to find an identical radio to rob for parts. However, the chances of finding another radio are slim. 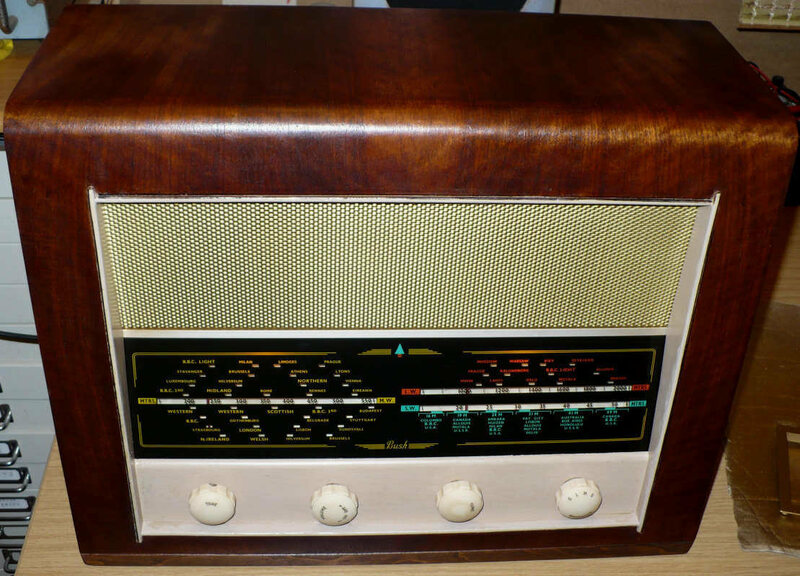 Even if a suitable radio could be found, it would mean scrapping the donor radio. In my opinion, scrapping any vintage radio is sacrilege. So, does the radio end up at the rubbish dump? Perish the thought! Fortunately, there is another option. Bluetooth uses the internet rather than a vintage radio aerial. This solves the interference or weak signal problems found on long and medium wave stations. You can use your mobile phone or tablet to send music or radio stations to your converted radio. You have a great choice as there are tens of thousands of radio stations broadcasting over the internet from all around the world. Unlike DAB, which is prone to weak signal problems, Bluetooth transmits a signal directly from your phone or tablet to the Bluetooth converted radio. The radio shown here was completely beyond repair and totally unsuitable for restoration. The chassis had been got at and, basically, completely ruined. The radio had been used as an extension loud speaker, but that had limitations. With Bluetooth fitted, the radio was given a new lease of life. The dial lit up for the first time in years, the BBC news emanated from the original loud speaker… Needless to say, the customer was very happy. There’s some controversy about fitting Bluetooth technology to a vintage radio. This is understandable because of a popular misconception… the insides of a lovely old radio have to be ripped out in order to add Bluetooth. This is a myth, it’s fake news… there is no need to destroy a vintage radio in order to add Bluetooth circuitry. There’s usually plenty of room inside the cabinet to house the Bluetooth electronics. The beauty of this is that the Bluetooth addition can be removed at any time, returning the radio to its original state. However, there are some situations, especially in smaller radios, where original components might have to be removed to make way for the Bluetooth electronics. I believe that a vintage radio should look like a vintage radio and sound like a vintage radio. When adding Bluetooth technology, I aim to retain authenticity. In order to achieve this, I use the radio’s original loud speaker and a mono amplifier. I don’t fit a stereo amplifier with two speakers because, firstly, early radios were mono and, secondly, there is no room for a second speaker. Fixing a second speaker to the back panel of a radio will not produce proper stereo sound, especially if the back of the radio is against a wall. I won’t make a hole in the back panel and fit a cheap Bluetooth module. 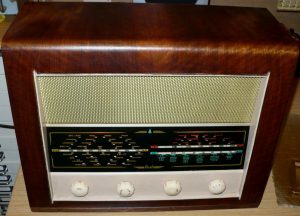 The appearance of the back panel is as important as the appearance of the front of the radio. When looking at the radio, from any angle, it should appear original. The only tell-tale sign will be the USB lead which plugs into a phone charger. All radios are different so, once on the workbench, your radio will be assessed. The original speaker will be checked and tested and, hopefully, left in place and used for the Bluetooth sound. A new volume control will be fitted, replacing original one. 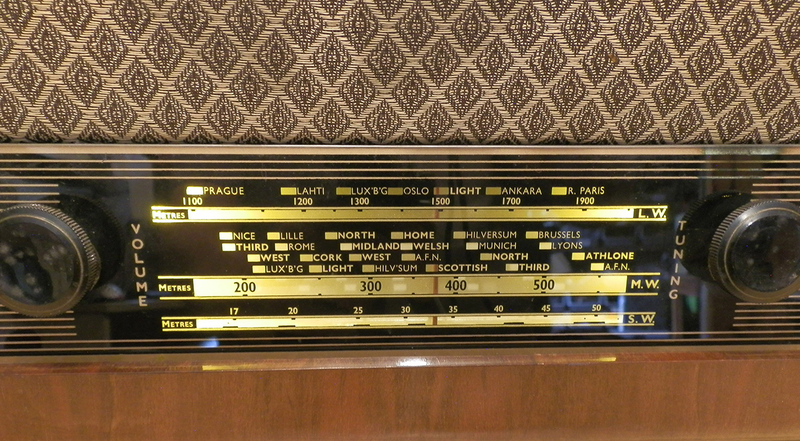 On some radios, it’s possible to utilise the original tone control. The mains lead will be removed and replaced by a USB lead. The Bluetooth circuitry will be fitted and, if applicable, LED lights will replace the original dial light bulbs. You can see how effective warm white LED dial lights are from the photo. I fit Bluetooth technology to vintage radios, but I don’t destroy vintage radios in the process. Also, I won’t mix old and new technologies, in other words. I won’t connect Bluetooth technology to high voltage valve circuitry. If you have a vintage valve radio which is beyond repair, why not consider the Bluetooth option? Contact me via email, by phone, or by using the form below, and we’ll take it from there.